In case you missed it, there had already been a second look at swans three years ago in this journal (http://mbwbirds.com/swans-i.html), but I think it’s about time for a third look, especially in light of some interesting photographs that Jim Mattsson took in Washington County last December (see Figures 1–4). Wait, hold on! What’s this? Photos in an ID article after all those critical comments of them in the previous issue of The Loon (“Birding by Hindsight: A Second Look at Photographs”)? Yeah, well, you got me. But I’m just optimistic enough — or is it arrogant? — to think that photos can be handled correctly here. Accordingly, I promise to proofread the article in its final form before it goes to press to make sure the captions are correct, and that the text refers to field marks in a photo which really are visible and not contradicted by other photos. Trumpeters with pale “wear spot” on lores). base = Trumpeter; more sharply curved or angled = Tundra. 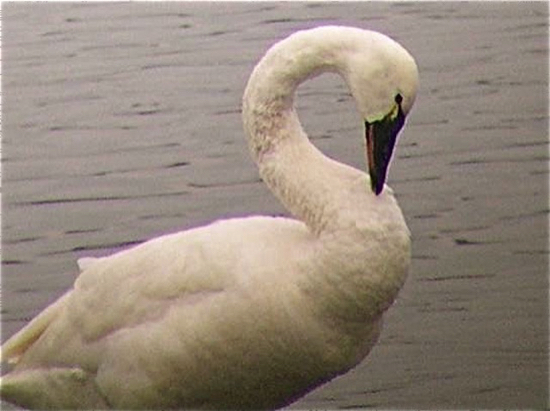 back of head = Trumpeter; gape-to-tip distance 1.5 times = Tundra. some pink at base of bill in fall/ early winter = Tundra. closer to bill tip than eye suggests Tundra. higher and broader rear profile suggests Tundra. Trumpeter; grayish more even overall = Tundra. • Leg color of immatures – olive = Trumpeter; black = Tundra. 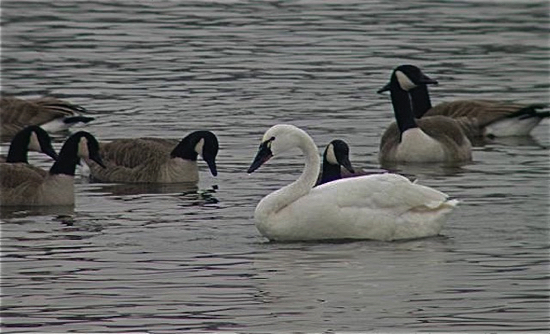 So, with all this in mind, just what is the identity of that adult swan photographed by Jim Mattsson on 11 December 2006 at Point Douglas Park, Washington County? Washington County. Note especially overall size and rear-end profile. Washington County. Note especially culmen shape and gape feathering. Washington County. Note especially shape of forehead feathering. Figure 4. Tundra/Trumpeter swan? 11 December 2006, Point Douglas Park, Washington County. Note especially gape feathering, black between eye and bill, and nostril position. Photo by Jim Mattsson. So, again, with all this in mind, just what is the identity of that adult swan? While not all ten of these listed features are considered diagnostic, the majority of them are, and most would suggest it’s a Tundra Swan. Most, but not all. Especially troubling to me is the V-shaped forehead feathering, and I wonder if that loral spot might just be from wear and not necessarily diagnostic for Tundra in this case. I have to wonder as well if swans hybridize. 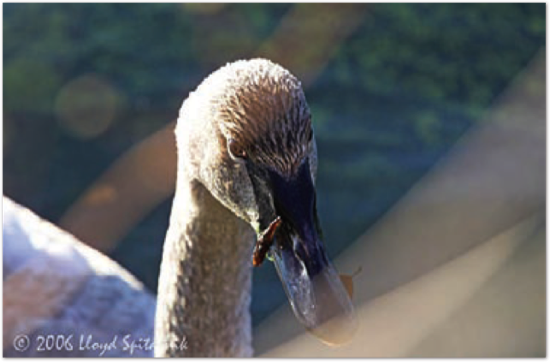 Well, as you contemplate the swan from Point Douglas, here’s another swan to consider, courtesy of photographer Lloyd Spitalnik (see Figures 5 and 6). 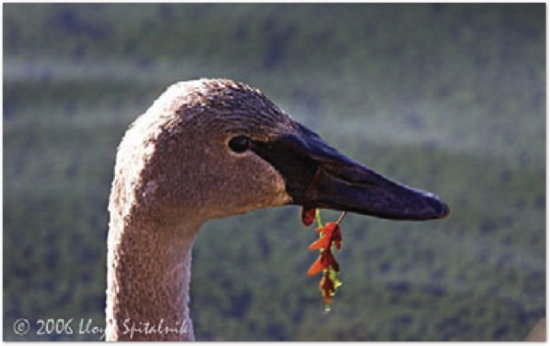 About the same time I received Jim Mattsson’s photos, Lloyd’s photos of an immature swan in New York were being discussed on the “Frontiers of Field Identification” listserve. Figure 5. Juvenile swan. New York City, 16 December 2006, © Lloyd Spitalnik. Figure 6. Juvenile swan. New York City, 16 December 2006, © Lloyd Spitalnik. Note the V-shaped forehead feathering. This Frontiers forum, by the way, is a curious one, with some participants apparently considering themselves expert enough to post comments on almost every ID subject which arises. But too often the threads of discussion unravel and disappear with no firm conclusions about the ID in question. (Too often as well, the talk involves the tiresome issue of gull identification!) There is lots of good ID information here, though, among the ego trips and ramblings, and it’s worth surfing through its archives to view some of the discussions (http://www.surfbirds.com/maillist/?id=62). But back to the swan in question. 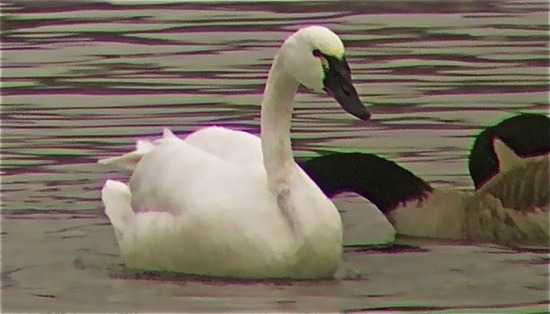 At first, the identity of this bird may not seem particularly challenging, since everything in the photos suggests Trumpeter Swan: the V-shaped forehead feathering, the wide area of black between the eye and bill (with the top edge of the black tangent with the top of the eye), the nostril positioned half way between the eye and bill tip, the relatively straight culmen, and flat crown shape. However, take a second look at this list of field marks: the first two are only diagnostic on adults, and the last three are more suggestive than conclusive. I also find it odd for the bill to be completely black in December, rather than partly pink. But I think it’s safe enough to call this a Trumpeter, once you consider all these features in combination. Most on “Frontiers” also concluded it was a Trumpeter, although their reasoning was usually flawed, as they cited less-than-diagnostic field marks or those only applicable to adults. 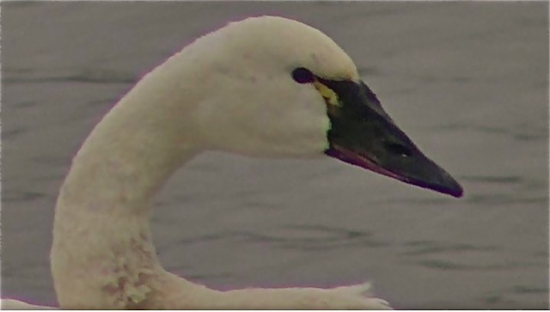 At least one of the “experts” confidently concluded it was a Tundra Swan, even though the only feature which suggests Tundra is the curved shape of the feathering at the gape — a field mark only safely used on adults. I thank Jim Mattsson and Lloyd Spitalnik for their generosity in allowing use of their photos to illustrate this article. My thanks as well to readers for tolerating what might be described as this exercise in hypocrisy: i.e., using photographs to illustrate an ID article after recently ranting about their use. You have to admit, though, I deserve at least some credit for not writing anything this time about dowitcher identification....after complaining about that in each of the last three Hindsight articles.